Sitting here after the Civil War, I️ can’t but help to think, “what a difference a year makes.” Yes, there are some entitled myopic fans shouting “we could have been 10-2!” Or “we should have been X and X! !” Well, to be honest, if that’s your response to what you saw this season, I’d prefer you jump on that Husky bandwagon up north or that Trojan horse down south because that’s a level of entitlement that I’d expect out of those fan bases, not ours. I’d prefer to think that our fans are rational, with an ability to put things into historical context. So, the point of this article is to break down the season game-by-game while also putting everything into a broader context and historical perspective. Parataxic distortion is a psychiatric term first used by Harry S. Sullivan to describe the inclination to skew perceptions of others based on fantasy. The “distortion” is a faulty perception of others, based not on actual experience with the other individual, but on a projected fantasy personality attributed to the individual. I think this is useful because I think a lot of fans had distorted expectations coming into this season. Coming into this year, we returned the worst defense in football and a top 30 offense, and we were looking at starting up to five freshman. Did anyone really think that was a recipe for a 10-2 or 11-1 season? Especially when we know elite coaches typically win 5-7 games in their first year of a turn-around project? 1. 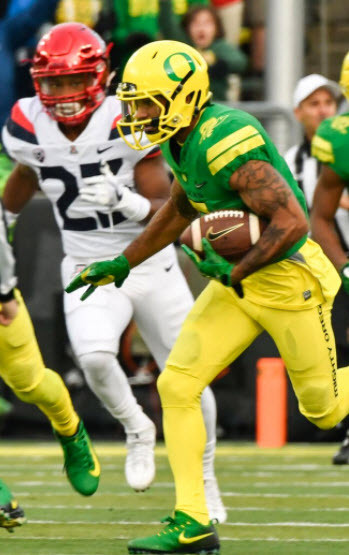 An 8-10 win team barring injuries to five people ( Justin Herbert, Royce Freeman, Darren Carrington, Charles Nelson, and Troy Dye). 2. The defense would be dramatically improved, and, if relatively healthy, would be in the top quarter of the conference and top half of the country. 3. The offense was going to have some bumps associated with transitioning to a power spread scheme. 4. A top 10 recruiting class. 1. Going 7-5 (Herbert missed 5 games; Royce missed 1 and should have missed 2–he was obviously running injured against WSU; Carrington missed every game; Nelson missing 3, played very limited in a 4th; Dye healthy (missed half of UW game due to Achilles injury). My pre-game expectations: I hope they demonstrate control of the game, this is going to take some time to turn around. Pre-game: God, I️ hope that this is the real deal, but this game will tell us a lot. What happened: This is exactly what I️ was talking about in regard to the bumps and bruises of converting to a power spread. In a power running offense, you expect to be able to sustain drives and chew clock. That is what we attempted to do in the 2nd half, and, quite frankly, we couldn’t. That doesn’t mean we were bad, it just takes time to instill that technique and attitude, and it takes time for the coaches to know what they have in their players. Pre-game: This is a trap game, but a good staff doesn’t let their team sleep on these. If we win a blowout, I’ll be happy. If we win a tight one, meh. If we lose, I’ll take back all the nice things I️ said about Willie Taggart. Pre-game: Given that Manny Wilkins is family friend and I️ know his backstory, I️ was torn. That kid is much better than advertised, but I️ honestly think we’ll win by 17. What happened: Sparky’s D is much improved, and the loss of Nelson was much worse than I️ anticipated. The fan in me said “WHAT THE HELL!?! ?” The analyst in me saw a coaching staff trying to figure out what it had. A critical component of the game plan was a designed QB draw read: spreading 4-5 receivers to the very edge of the boundary and anticipating Herbert would be faster than their linebackers. On three critical downs we ran this play and, to Sparky’s credit, they beat us with confusing blitzes on all three downs. That and Nelson’s absence cost us the game pure and simple. Pre-game Expectations: God, I️ don’t know what to make of this team. Cal looks much improved, especially on defense, I️ don’t know if Nelson is back, and our line keeps shooting itself in the foot. I️ think this is a 50/50 game we win or lose by a touchdown unless that ASU game was an aberration. Analyst Me: That’s the learning curve I️ expected from our offensive line this season, but I️ didn’t think it would be that good. Wow! This staff is as good as advertised. Please, please let Herbert and Freeman be healthy. Pre-game expectations: If Braxton Burmeister is as good as advertised and this line plays as well as they did against Cal, this is 50/50 game. 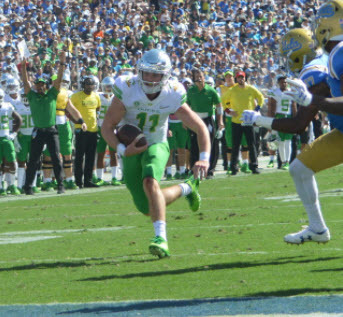 What happened: The same defense that shut down USC’s Sam Darnold a week earlier came into Autzen and dared us to beat them through the air. We could not, and with Royce running maybe at 50% we were pretty ineffective. Again, no Nelson, but why aren’t we running the heck out of the Jet Sweep? Pre-game expectations: This is going to be ugly. Period. Full stop. What happened: This was ugly, period. Full stop. We got dominated on both sides of the line of scrimmage. They were better in all 3 phases, and we got out-coached. Pre-game: Boy I️ hate Jim Mora. Please let us beat Jim effing Mora. But, if we’re gonna lose, let’s keep it close. Analyst me: Well, it’s pretty hard to get creative when Nelson is playing on one leg, your fly back (Taj Griffin) is out, and your backup running back Tony Brooks-James is out. Crazy thing is, everyone in the stadium knew we were going to run the ball 8 out of 10 times, and while Royce was in the game, we did move the ball effectively. We just kept shooting ourselves in the foot, and penalties and a couple fumbles in our own territory didn’t help. Utah Pre-game: This is probably the best defense we’ve faced this year, but fortunately, their offense is terrible. I’m putting our bowl hopes on winning this game. The only way we win this is game is a 13-10 dog fight. Analyst me: It’s amazing how the playbook opens up when you’re relatively healthy. Jet Sweep with Taj? Check! Intermediate routes with Nelson? Check! Outside read with TBJ? Check. Dominant inside, downhill running with Royce? Check. Blowout win? Didn’t see that coming. This offensive line is coming along nicely! 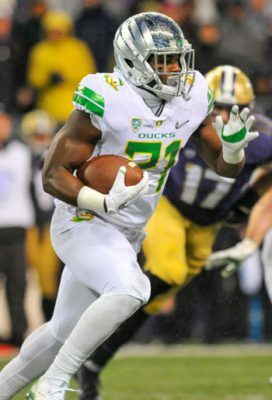 Royce ran well against the Huskies. Pre-game (looking at advanced stats): If Herbert plays, the Huskies win by 10, 38-28. If Herbert doesn’t, I️ just hope it’s better than last year: Huskies win 50-10, and only because we get a touchdown in garbage time. Analyst me: I️ honestly can’t believe the way we controlled the line of scrimmage on both sides of the ball. Everyone in the stadium knew it was run or a bubble screen, and we were still getting 5 yards per play on offense until a penalty or fumble put us behind the chains. On defense I️ was more surprised, for the most part, that we controlled the line of scrimmage. 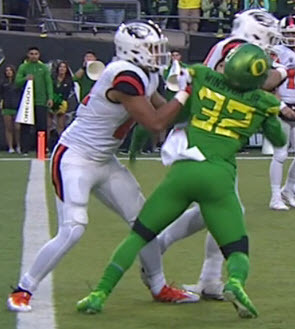 The only success the Huskies had running the ball was when their line could get a hat on Dye and our one non-D1 inside linebacker got caught in the wash. Our freshman corners occasionally got beat deep by a first round talent at wide receiver. I️ can’t help but imagine what would have happened with Herbert and Carrington playing. Pre-game: He’s baaaaaack. To quote Billy Madison, “now you’re all in big, BIG trouble.” Our much improved defense keeps Khalil Tate in check and Herbert adds the third dimension to an offense that had been playing with one arm behind its back. 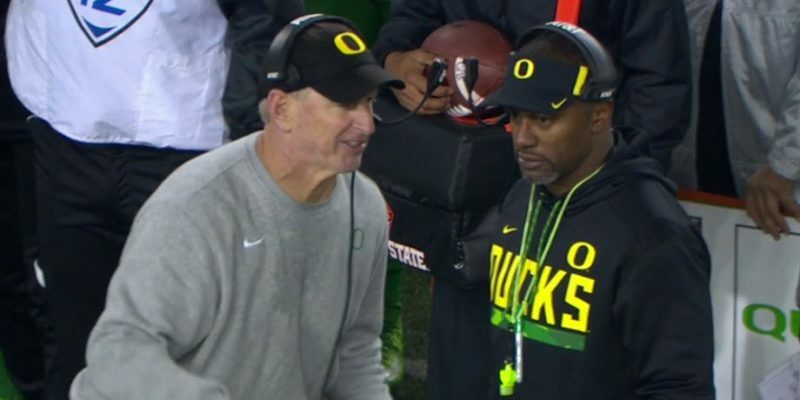 Oregon wins 45-35 (I sent this prediction to Charles prior to the game). What happened: Pretty self explanatory, but when you have a legitimate threat downfield and the QB has the ability to bail you out of third and long, the offense completely changes. It’s amazing how “creative” coaches look when things are working. Guess what? 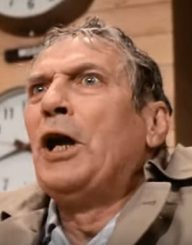 Other than the flea flicker I did not see a single play or formation that I hadn’t seen earlier this year. FWIW, I really thought my prediction of allowing only 35 was toast after the first half. Those second-half adjustments on both sides of the ball were impressive, especially on defense. What happened: Amazing how “creative” and “diverse” our offense looks when healthy! While I expected a blowout, I didn’t expect this. The Ducks were dominant in all 3 phases, and the last two weeks exceeded what I was hoping to see in terms of fundamental improvement. These are foundational wins. This season is exactly what I️ hoped for and expected. I saw a young team that learned to handle adversity and that set the foundation for what’s to come. This staff turned the absolute dumpster fire of last year into a team that exerted its will over teams at times. Plus, this team is in the process of adding reinforcements that will close the talent gap that has developed in recent years. Yes, the emotional, irrational fan in me thinks about what could have been, but that emotional, irrational side of me doesn’t realize that we would have needed to be extremely lucky and healthy for a 10-win season this year. That irrational fan in me doesn’t acknowledge that Nick Saban, Jim Harbaugh, Chris Peterson, and Pete “the cheat” Carroll only won 4 to 7 games in their first years. And they did so with FAR superior talent than Taggart and company had this year. For additional reference let’s look at the 4 top candidates for the Oregon job last year and their records with their respective teams this year. We are most likely going to finish with more wins than all 3 comparable programs, above the season average for elite coaches in the first year of a rebuild! This team comes back with A TON of experience where it counts and young talent where it is badly needed. Both the offensive and defensive lines will be dominant. 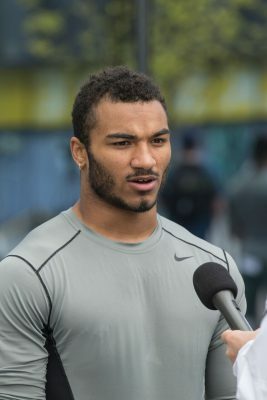 Losing Tyrell Crosby and Henry Mondeaux hurts. 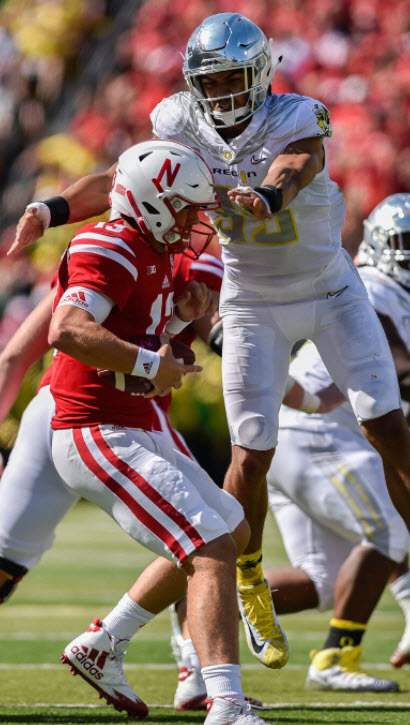 However, I️ predict that we likely move Austin Faoliu over to DT from NT and will actually upgrade the D-line (assuming Jalen Jelks stays). Our linebackers and DBs took their licks this year and are going to be better next year (Brady Breeze will be a household name). Jelks will become a 2nd round draft pick, and the defense will rank in the top 25. La’ Mar Winston beats the block and nails Nall. On offense, the loss of Royce is exceptionally hard to replace. However, what people close to the program have told me about Cyrus Habibi-Likio sounds oddly reminiscent of LaMichael James (there’s a reason we red-shirted him). Darrian McNeal is going to be a revelation next year and TBJ will excel. What we lose in brute force from Royce we offset in explosive plays behind a veteran and salty offensive line. The receiving core will take another step forward as Taj will develop within the slot, Johnny Johnson and McNeal will take a giant leap forward, and we will add the munitions of a top 5 recruiting class. We will finish with a top 10 offense statistically. Ultimately, this years struggles will prove to be the best thing possible for the team, as it will allow the coaches to motivate the troops into an off-season of work (as opposed to being lulled into comfort with instant success). Looking at next year, I️ can’t help but get excited. I️ only see two 50/50 games, and they are both at home. I legitimately see this team winning 10 games and playing for the conference title. In the meantime, BUCKLE UP! Go Ducks!